Holly and Eric are set up on a blind date by their mutual best friends. Holly is dressed to a “T” and not suited to ride on the back of Eric's motorcycle. Eric is too tall to fit comfortably in Holly's Smart car. When he makes a date for later that night in front of her, they agree that they are not that compatible. Katherine Heigl who also produced this film plays Holly Berenson, the owner of a quaint coffee shop where she bakes and caters delightful confections. She is a bit of a control freak. Eric Messer who prefers to be called Messer is a laid back network sports director who is an insufferable womanizer. When their best friends die in a car crash, they leave behind their few months old baby to the care of Holly and Messer who are the god parents. They move into the couple's beautiful Atlanta home and attempt to co-parent orphaned baby Sophie (played by triplets Alexis, Brynn, and Brooke Clagett). Even though they have been around the baby since it's birth they become inept in the care of the child from changing diapers to feeding her. They are forced to juggle their individual career ambitions and social calendars with each other with the help of the neighbor's 12 year old babysitter who seems to be the only one that can quiet Sophie's cries. Messer sleeps on the couch in the den where he entertains sleepovers with one night stands. Holly begins to flirt with Sophie's handsome doctor Sam (Josh Lucas). The social worker in charge of deciding if Sophie's needs are being met encourages them not to get involved. As the two struggle to find common ground and still raise Sophie in a loving environment they find themselves attracted to each other. If you have seen the trailer for this movie, then you have pretty much seen the whole thing. This formula rom-com directed by Greg Berlanti was written by Ian Deitchman and Kristin Rusk Robinson. Two good looking people living in an affluent home with a mortgage covered by the estate of the deceased parents and having good jobs “struggle” to raise a beautiful little girl. The most horrifying problem they seem to encounter is dirty diapers and Sophie is not impressed by Holly's gourmet baby food concoctions. The movie's light hearted success rests solely on the comic timing of Heigl and Duhamel. Heigl continues with the same obsessive neurotic professional she has refined in her latest work. Doing almost a Meg Ryan thing only not as ditzy. 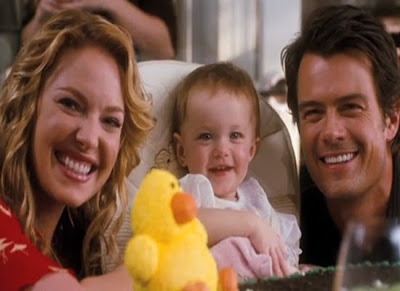 Duhamel seems comfortable supporting Heigl with the arrested development male who finds that life means responsibility. Actually his only job is to look good. Their bickering can be a bit tiresome when you compare their predicament with your own everyday problems. But for an afternoon of feel good romance and a pretty little baby you can not go wrong for a couple hours of mindless entertainment.